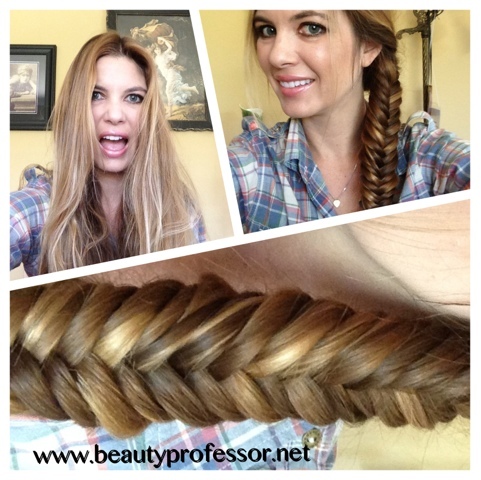 Beauty Professor: Side Fishtail Video Tutorial! Thank you so much!! As a hairstylist, I am sure have a wealth of hairstyles at your fingertips...what are some of your favorite ones to do? I so hope you are able to track down the Kanebo Sensai Foundation...I think you will love it when you get your samples. Let me know what happens...I've been getting a lot of emails from other readers hoping to find this foundation in their area and I would love to be able to give them even more direction on obtaining it (especially when they don't live on the West Coast like I do!). I think this looks great-it seems like it might be time consuming to master but it certainly looks fancy! Goes great with the simple natural makeup you selected-does the Chantecaille new liner really last as long as advertised? I don't know if they will work on your thick hair but the Mei Fa Hair Styx are my go to for a quick off the face up do. They would almost certainly work if you did just a portion of your hair. I've been using them for years and although the elaborate beaded ones are lovely, the new plain wood ones are the most functional and least expensive. Have you heard of them? Yes, the Chantecaille eyeliner really does last forever...it glides on easily and is completely waterproof and smudge proof...so impressed! I'll be doing a full review of the eyeliner (as well as the mascara!) very soon. I am intrigued by the Mei Fa Hair Styx you mention--thanks for the tip. Will have to take a peek ASAP! Great tutorial! I need to grow my hair longer to do fish tail braids. Thank you! This braid can be done with medium length hair as well, so give it a try! Hi B.P, one of my fav summer style thats easy would be a low pony tail at the nape or the side. Braid it the traditional way. Secure with elastic. Gently pull sections of the braid apart. Then coil it around the base of the ponytail & pin to secure it. It too looks like u did alot but its very easy. Today I called the neimans in Beverly Hills. Unfortunately, the kanebo salesperson was not in yet to help me. I gave my phone# and am still waiting for her to return my call. I will keep you updated. Take care, keep cool! Thanks for sharing the details of your favorite summer hair style! I am so going to try this ; ) It is crazy how elusive this Kanebo foundation is becoming...I have many readers trying to track it down to no avail! I have a call in for my Kanebo specialist at Fashion Island...will report back once I get some information...please do the same if you hear from the BH rep! That braid is beautiful! I would have to stop you on the street to examine it - it's so lovely! I wish I had hair I could braid like that. My favourite warm weather hairstyle is... putting all my hair up into a big bun. Everything strand of hair off the neck. I'm going to Hong Kong this summer and I'm already dreading the humidity. Ha! And about Hong Kong - oh yes, the shopping is amazing!~ and thanks, I'm really looking forward to being in Hong Kong again to visit my family :) Have you been to Asia? I've never been to the States and unfortunately most of the brands (fashion, cosmetics, skincare...) seem to be American and they can be marked up quite a bit when they're sold in the UK. I must visit the USA one of these days!!! But of course, Steph!! I love the idea of the donut ring...will have to try that this summer ; ) What kind of performing do you do? I have never been to Asia but would definitely like to make a trip to Hong Kong sometime in the future...yes, isn't that odd about out-of-country mark ups? I think that brands not indigenous to the States are marked up in a similar fashion! You must come here to shop all the luxury cosmetic brands...LA and NY have an insane amount of variety in that regard. They are still expensive but likely less than where you are! I'm a classical pianist so I give concerts either by myself or with other musicians about once or twice a month. You would likely love them both...they are equally wonderful cities with so much culture and energy. Hope you get to visit someday! A classical pianist...that is fantastic...I think it is such a talent to be able to master a instrument.